Following the front page article on our September 16 community meeting yesterday (9/17/14),see below, today (9/18/14) the publisher offered his opinion of the situation. KIHEI – The start date for construction on the long-awaited Kihei high school has been pushed back at least a year, and officials now say the school may not open until 2020 or later. The state Legislature had approved $130 million for the build-out of the school in its biennium budget passed last year. Lawmakers at that time predicted construction would begin in July 2015, with the school opening as early as 2018. 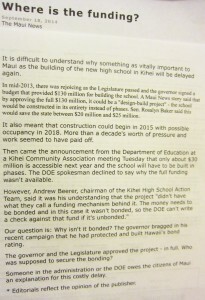 But the plan has changed because the state Department of Education will only be able to access $30 million of the appropriated funds next year, department officials said Tuesday at a Kihei Community Association meeting. About 75 people attended the night meeting. Nichols declined to explain after the meeting why the department was unable to access the full amount. 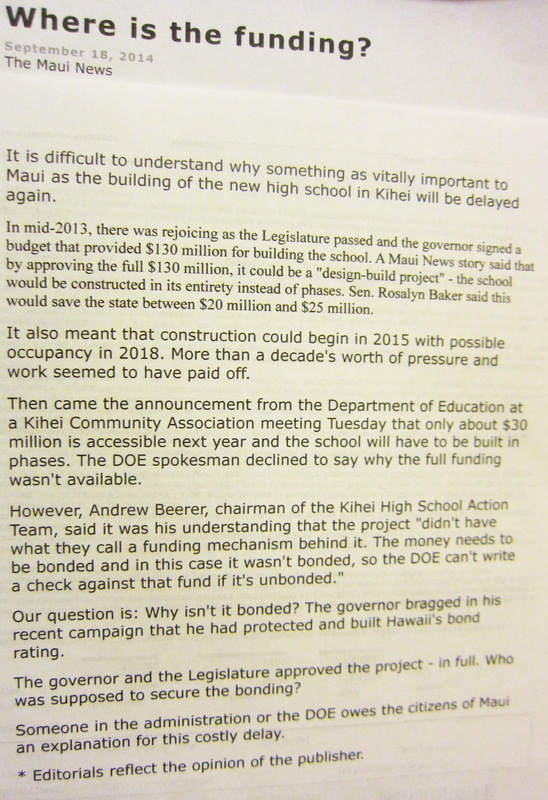 “I’ve had conversations with dozens of people in the administration, and it’s very hard to understand why this didn’t happen,” said Kihei resident Andrew Beerer, who wore a T-shirt with the message “Kihei High School by 2016” printed on the front. 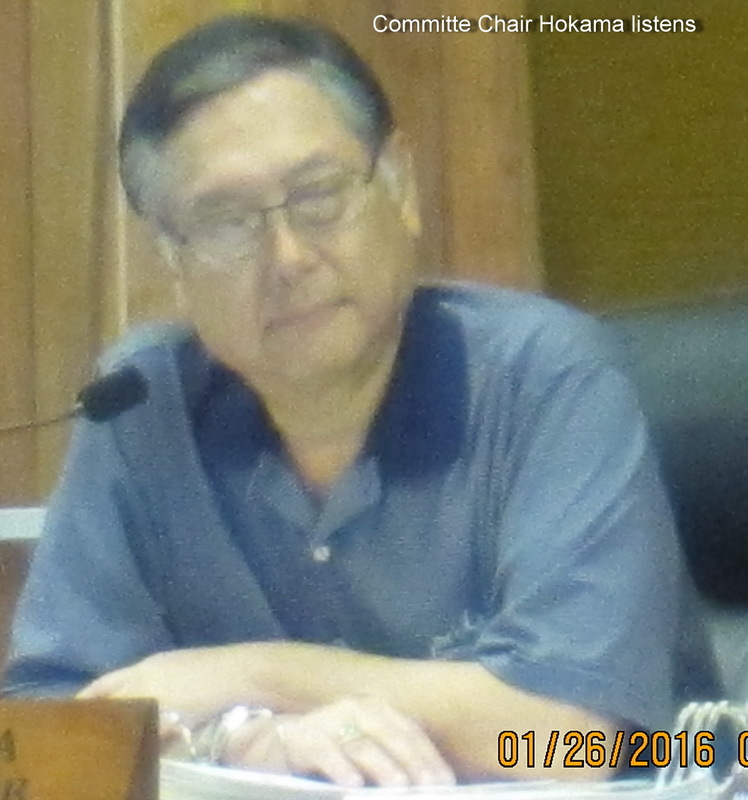 Beerer chairs the Kihei High School Action Team, a community group that has lobbied for a Kihei high school for years. “The best I can tell you is it (the project) didn’t have what they call a funding mechanism behind it. The money needs to be bonded and in this case it wasn’t bonded, so the DOE can’t write a check against that fund if it’s unbonded,” Beerer said. Because the department is unable to access the full $130 million, the plan and timeline for the build-out has been changed, officials said. Instead of “design-building” the high school all at once, the school will now be built in phases as funding becomes available, a process that traditionally takes more time and costs more money. Lawmakers said last year that building the school all at once would save the state up to $25 million. Nichols added that using the traditional “design-bid-build” process would allow more input from the community as each phase is built out. The $30 million that the department will be able to access by early next year will be used for off-site infrastructure, a two-lane entry road from Piilani Highway, two nonpotable wells, Piilani Highway intersection and roadway improvements, on-site stormwater retention, mass grading on-site and some paving of parking areas and driveways, Nichols said. Work on the first phase of the project is expected to begin during the summer of 2016, with completion of the first phase of construction projected for 2018 to 2020. Once the first phase is completed, the school would be open to accommodate 800 students and 120 staff members, with two classroom houses, an administrative student center, a library, cafeteria, elective buildings and selected athletic facilities, as well as infrastructure improvements. The second and final phase, which will be “developed as enrollment grows,” will have a capacity of 1,650 students and 180 staff members. While some residents expressed frustration Tuesday with further delays, Beerer encouraged the community to remain optimistic. “The plan has changed drastically and the timeline has changed drastically . . . but we have to be strong and we have to keep moving forward,” Beerer said. “We’re fighting a huge battle here, the DOE hasn’t built a high school in 15 years, and never to my knowledge have they built one on raw (undeveloped) land, so it’s a huge challenge and there’s great disappointment obviously. It’s not going to happen for my children, but I want to see it happen for the next children. . . . We have to keep pushing,” said Beerer, whose son and daughter will enter high school as freshmen in 2018 and 2019. 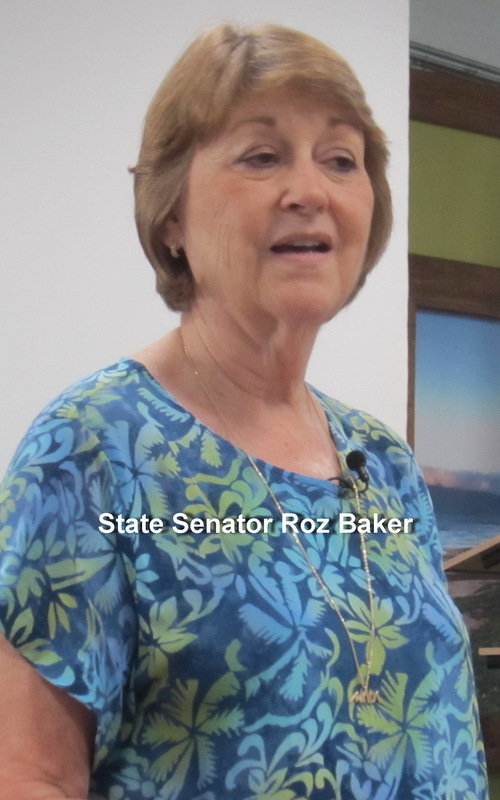 “Unfortunately, government moves slowly, but it’s the community support and community working together with the planners and consultants and other folks that will ultimately make it successful and it will be a wonderful state-of-the-art school when we get it,” Baker said at the Tuesday meeting. “You know how they say it takes a village to raise a child? I think it takes a village, and then some, to build a high school,” she said. 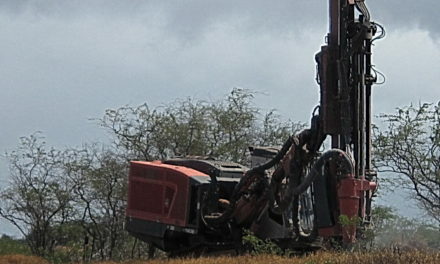 The proposed site for the school is on 77 acres of undeveloped state-owned land mauka of Piilani Highway in north Kihei. PreviousWHY THE HECK CAN’T WE GET THIS SCHOOL BUILT?!? 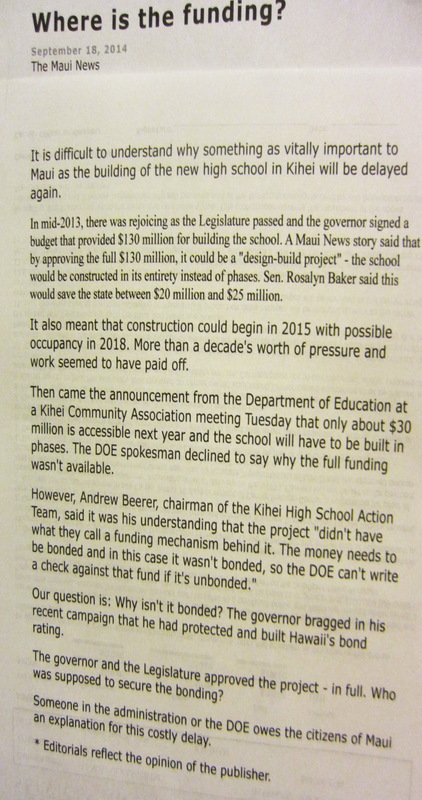 …build out of high school in Kihei seems distant.